That’s what my dad told me when I mentioned I was planning a trip to Greece. Before that, I had never heard of the place before. Usually, when you think of Greece, you imagine the blue waters of the mediterranean and the houses with their blue roof tops in Santorini. 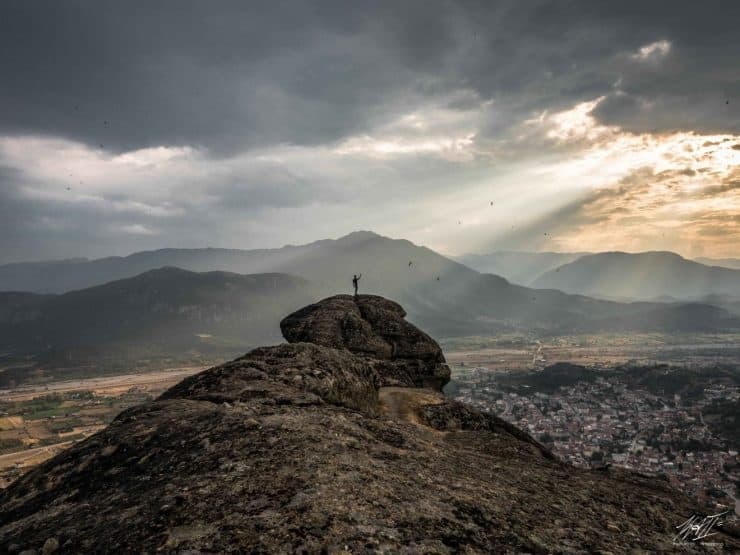 A huge rocky landscape with massive monoliths and tiny monasteries perched above would not have come to mind. My favourite shot of the trip. 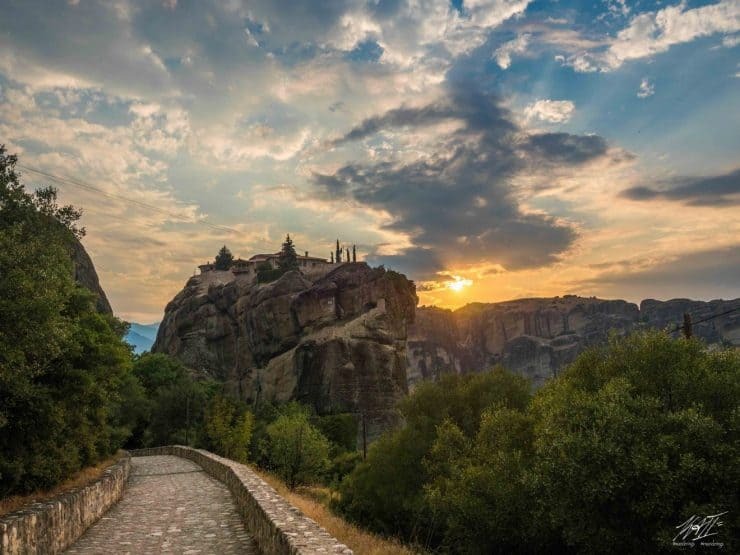 Listed as a UNESCO World Heritage site, Meteora in Greece is an area with huge monolithic pillars and rock formations. It’s not easy to describe how magical this place is, so I’ll let the pictures do most of the talking. Above is a 360 Video I took while there, you can scroll to take a look around. You can see four of the six monasteries here: Monastery of Great Meteoron, Varlaam, St. Nicholas and Rousanou. Rent a car. 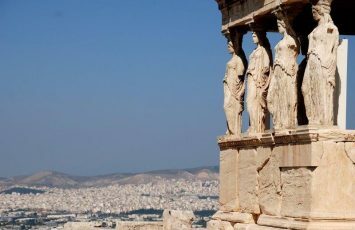 You can rent a car in Athens and drive North-West. It’s a very scenic drive, takes about 5 hours. 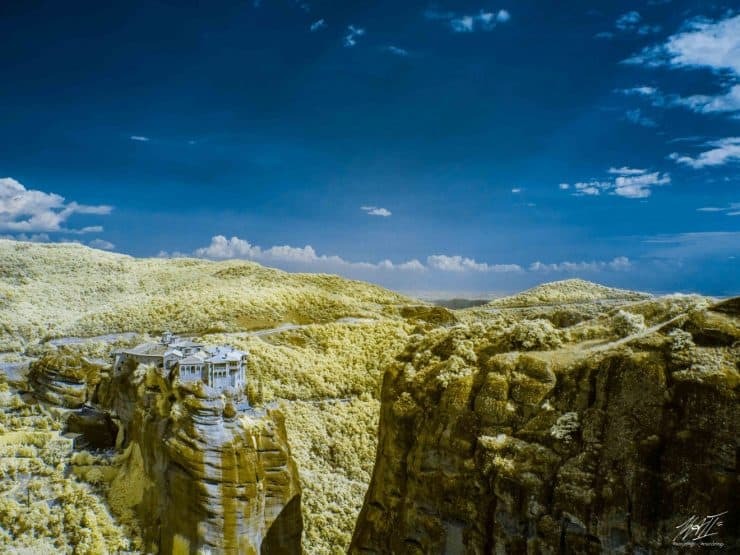 If you drive, I highly recommend that you do not end your trip in Meteora, but instead continue on north to Thessaloniki. Take the train. 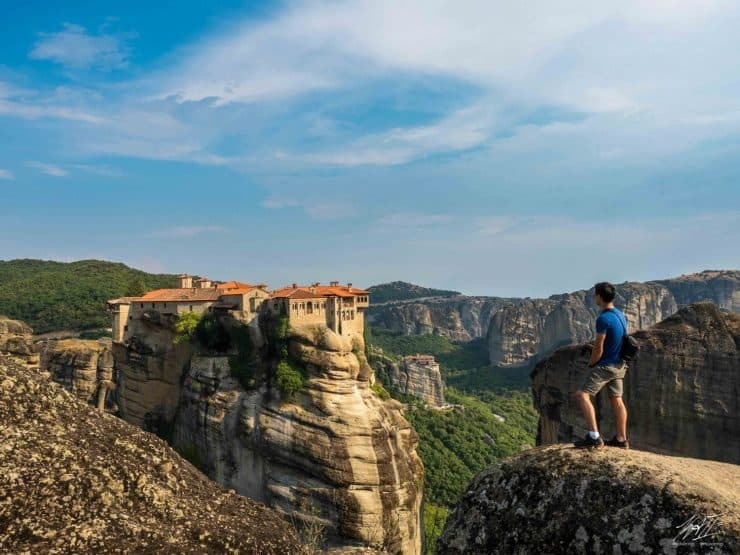 The train ride is 5 hours from Athens’ main station, and your journey will end at the main town of Meteora, Kalambaka . You can book your train tickets online here; you may change the language to English by selecting EN at the top left. There is one direct train trip per day; others will require you to change trains along the way. The direct train leaves at 08:27am from Athen’s main station. I recommend you book in advance, as there were some people on the train that did not have a seat. It’s a cheap ticket only 22 euros return. You are able to take a train towards Thessaloniki as well, instead of heading back to Athens. 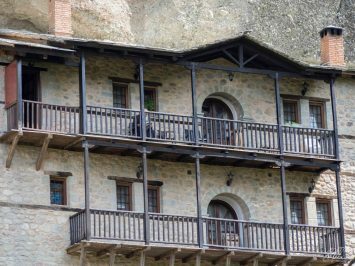 There are several small guest houses in both Kalambaka and Kastraki, the two towns in Meteora. Both are very close to each other and either are ideal places to stay. Kastraki is a bit quieter. 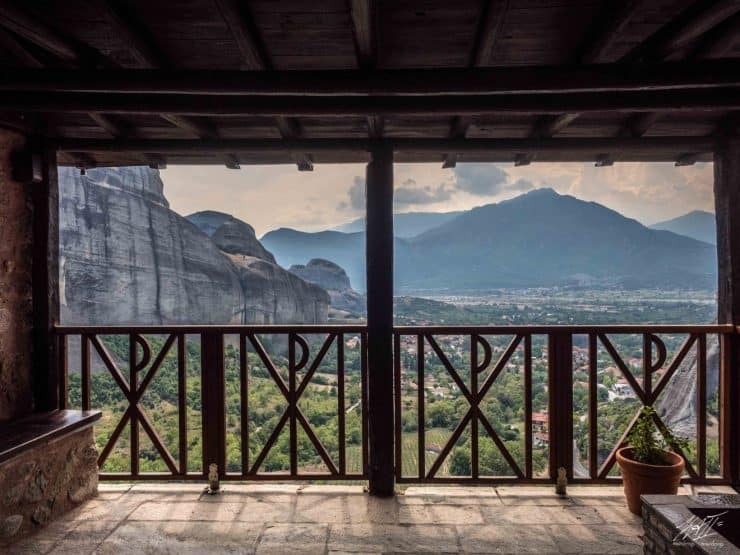 I stayed at a place called Guesthouse Lithos in Kastraki, with a balcony with a view of the amazing Monoliths. I had a room to myself as it was just 45 euros a night. Plus I wanted a place for a good night’s rest after walking around the whole day. I booked it through Agoda. There are a few hostels you can book through either Airbnb or through Hostelworld. Prices range from 12 euros to 24 euros depending. Backpacking Europe – what about visiting Hallstat in Austria? 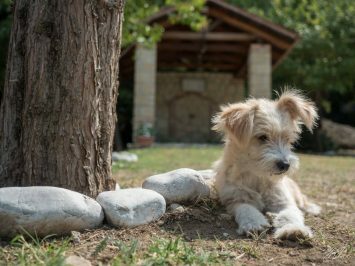 You have a few options to get around to visit the monasteries. 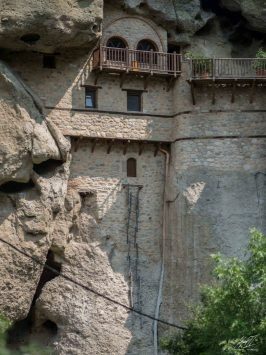 All the monasteries have road access to the bottom of each one, take note however that for most of them, there are still many steps to reach the top. There’s a bus that makes a few stops in either of the towns to pick up passengers, then it makes it’s way to each of the monasteries (you can ask your accommodation for the timings), it goes by hourly intervals. 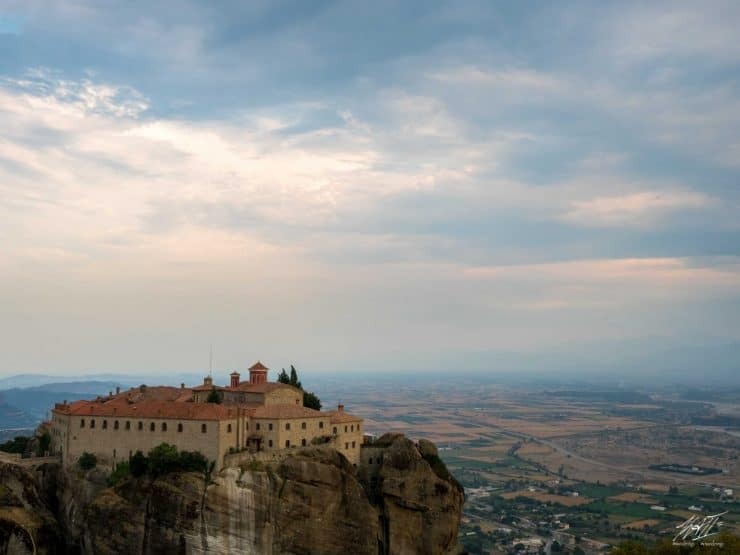 If you drove from Athens to Meteora, then you can have the easy life and drive to each of the monasteries. 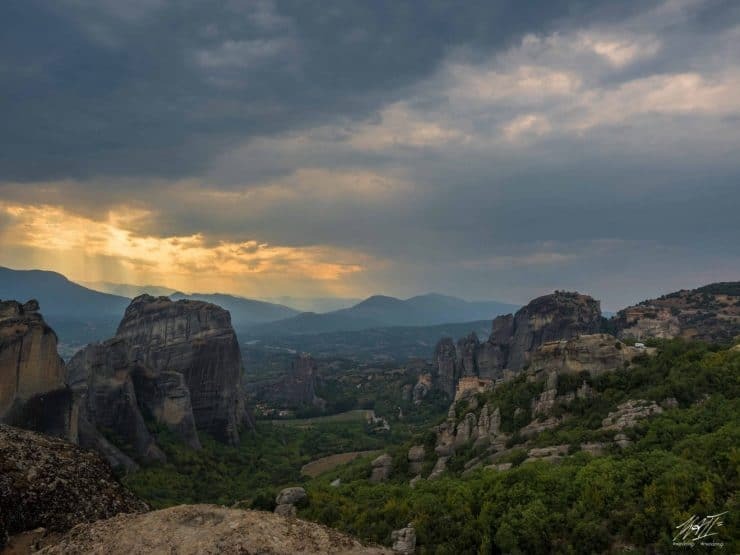 However, if you truly want to experience the natural beauty of Meteora in Greece, you should do what I did and walk. Be prepared though, it’s up up up-hill. Walking will also give you the best photo opportunities. Friends with the clouds. You can get some great shots here. I was lucky enough to catch the sun rays and silhouettes towards sunset hour. 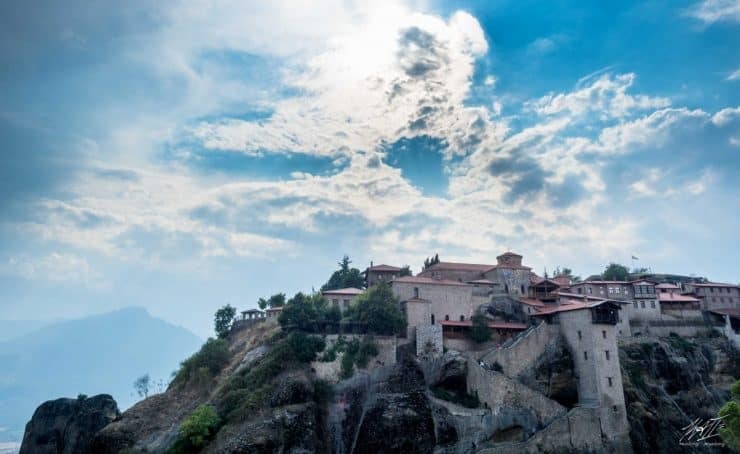 The main reason, other than the amazing scenery that people come here for, is to check out the iconic Monasteries perched on top of the rocks. The Monastery of Great Meteoron. The largest of the six. If you intend to visit only a few of the Monasteries, this should be on your go to list. 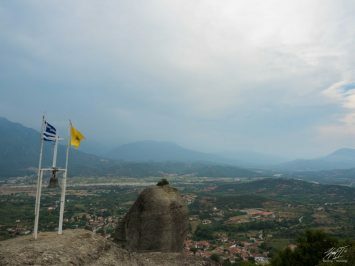 The view of the town of Kastraki from Monastery of the Great Meteoron. 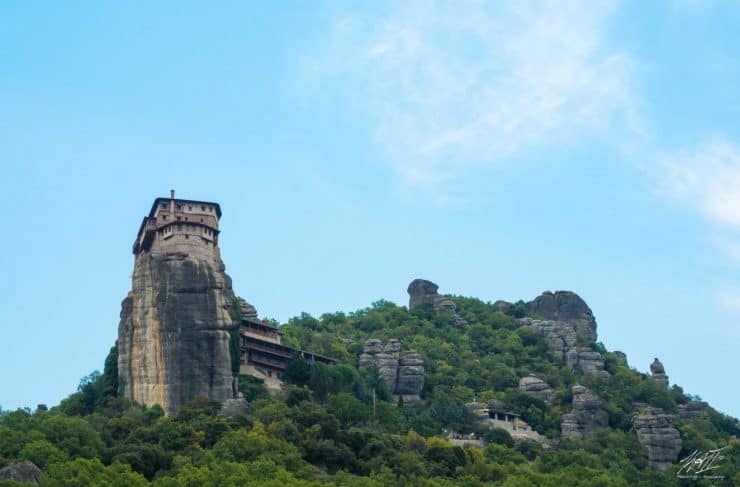 Monastery of Varlaam is the second largest monastery in Meteora, with the Monastery of Rousanou behind it. Monastery of St. Nicholas Anapausas. Currently only one monk resides there as of 2015. The view from St. Nicholas. Monastery of St. Stephen is a Nunnery with 28 nuns as of 2015. Opening hours aren’t always fixed, they depend on the season you visit, for up to date timings you can check this website. There is a small entrance free of 3 euros per Monastery. Dress modestly, since you are visiting a holy place. Even men will be required to wear long pants to some of the Monasteries. I wore those convertible hiking pants that let you convert them to shorts to make things easier. At the Great Meteoron, shorts were okay. However, at St. Nicholas, you had to wear long pants, so it really depends, just play it safe. Access to food and water: At the bigger Monasteries there will usually be a van selling refreshments and light snacks outside. However, do not rely on this and do bring along a lot of water, especially when you intend to walk the whole area. Restrooms are available at the Monasteries. Some areas in the Monasteries do not allow photography, usually the areas of worship, please respect this. Do you have to visit all six? That’s really up to you. To me the monasteries are similar inside, I visited three of the six. The main one to visit would be Great Meteoron. I don’t recommend visiting all in a day as it would just be too rushed. 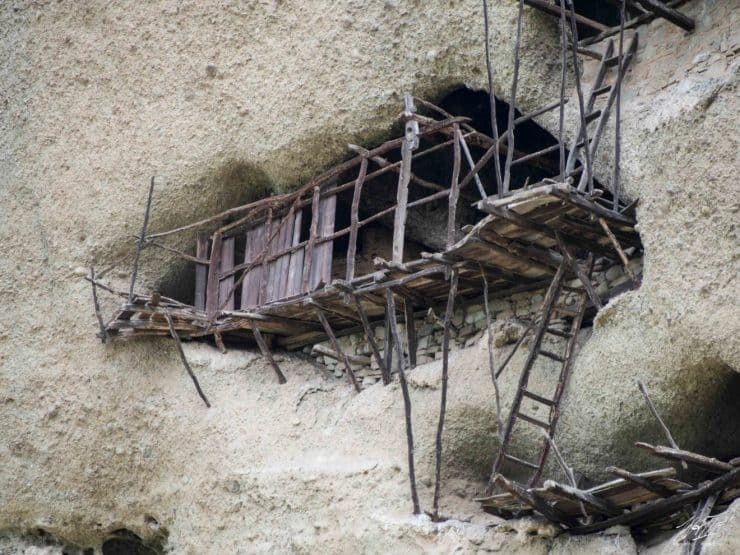 These caves are mind boggling, some monks spent the rest of their lives living up in these caves to be closer to God. Some of the hermit caves. Could you imagine living up there for the rest of your life? A close up. The towns used to deliver food and water to the monks living up here. If you really dislike having visitors. 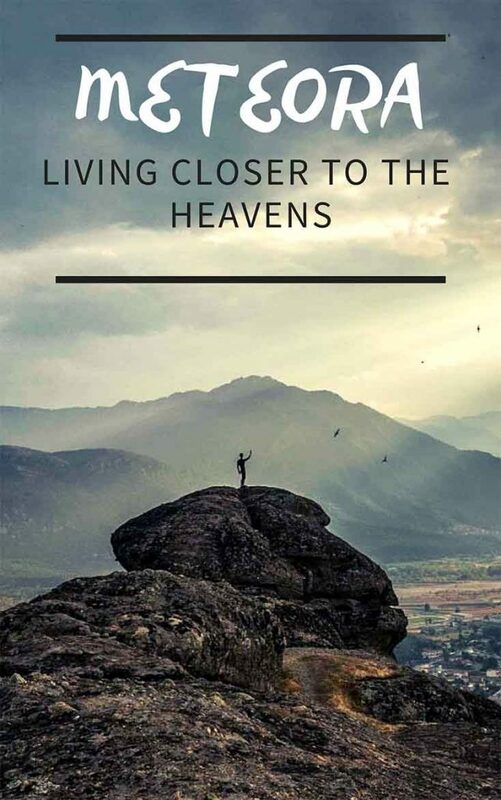 The monks lived up on the rocks to enhance their personal relationship with God. 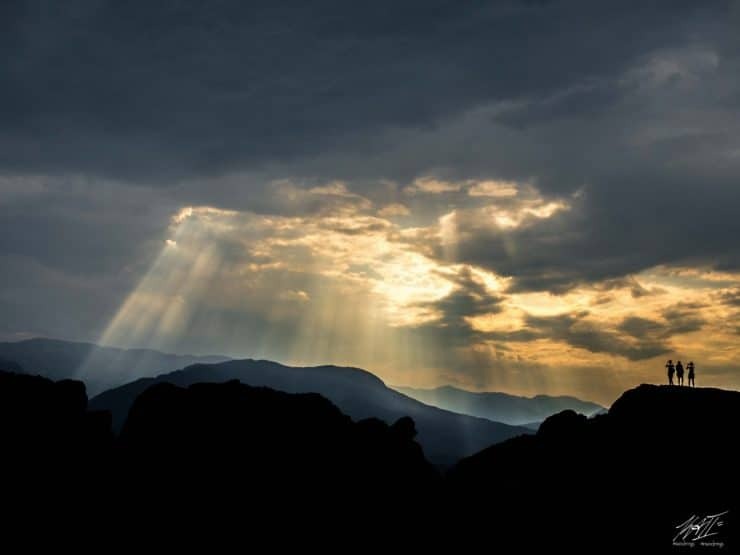 Their days were devoted to prayer; and high above the rocks their lives were free of any earthly distractions. 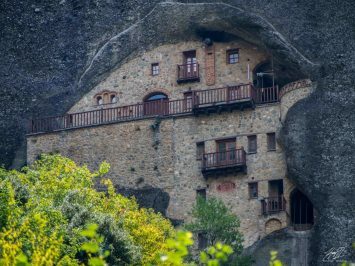 The Hermit Caves are at a small church called Panagia Church. If you are driving you can park along the main road (yellow circle), the gate could be closed at the front, just walk to the side of it and follow the path. 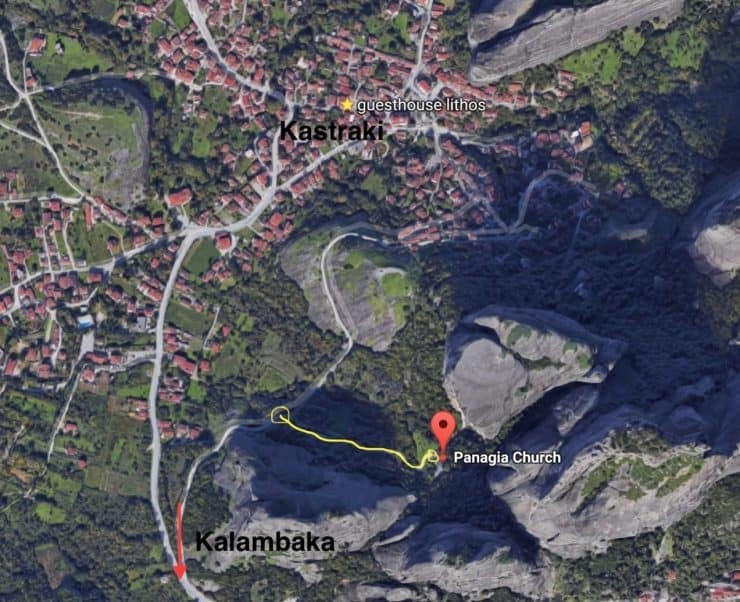 The path to the church lies on a road connecting Kalambaka and Kastraki. There’s this small chapel in the foreground of the hermit caves. Made a friend while I was here. Please say Hi for me when you see him. After all that walking, had to take a nap. 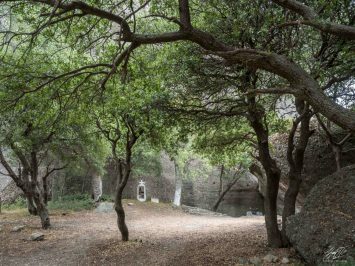 There are a few paths scattered around the area, one interesting trail circles around the Monk’s Prison. 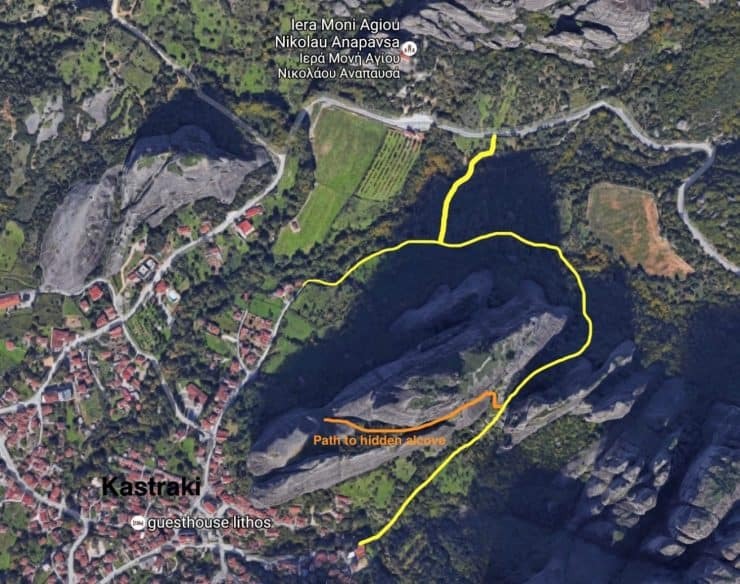 You can access the trail from Kastraki or from the road near Saint Nicholas. The orange path is a trail that leads up the side of the rock to a nice little hidden alcove, it’s a bit steep, so be cautious. While exploring the area, I turned the corner past a big boulder and was greeted by this fella with his friends. 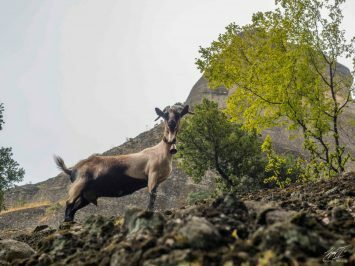 You’ll find some herds of goats along the paths. Don’t worry, from my experience they don’t bite. You can discover some hidden paths along some trails that lead to unique areas. This place was a hidden alcove perched above one of the monoliths. You can follow a rocky trail up the side of one of the rocks. 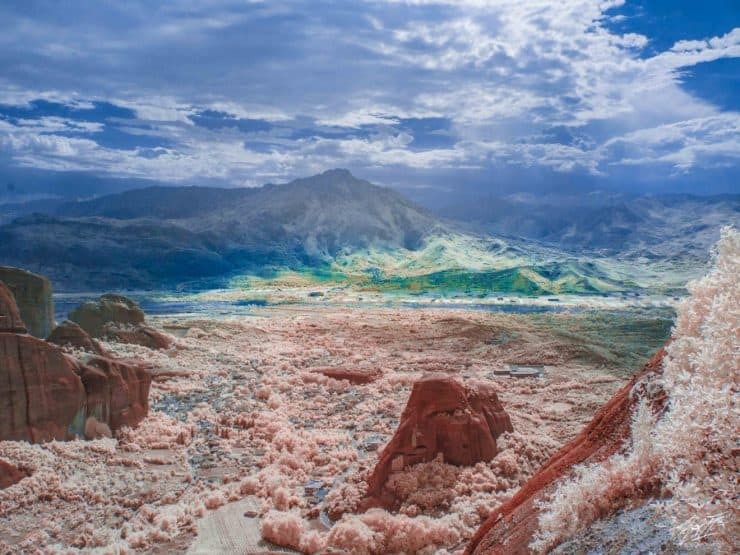 There is a bit of climbing involved to get to this hidden area, but you are rewarded with an amazing view. I wanted to get some decent shots of the stars here at night. However it rained on my second day here and the sky was slightly overcast. 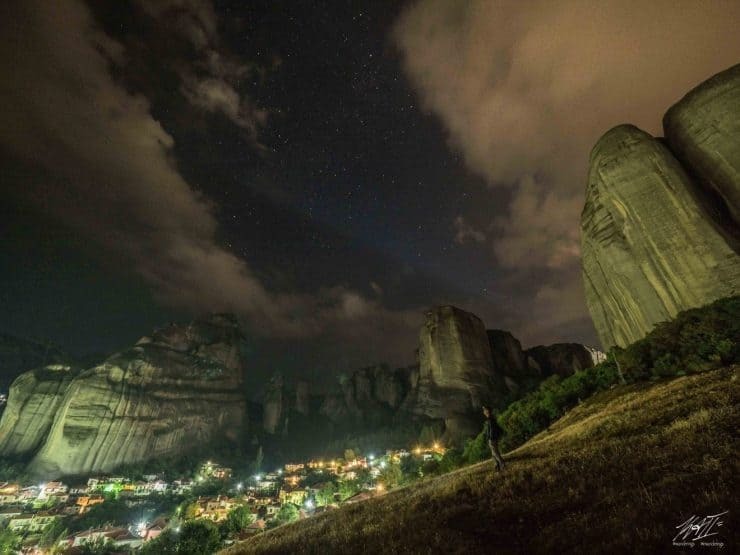 The town of Kastraki with the monoliths behind. I went there at the very end of October, it’s considered the warmest time of the year. If you are okay with the heat you can enjoy a lot less tourists. I was there from Wednesday till Friday. Two full days. Which I would consider slightly rushed. To really enjoy the area I believe 3 days would have been perfect. Be prepared to walk a lot if you aren’t driving. Bring good shoes, lot’s of water, sunscreen, a map. 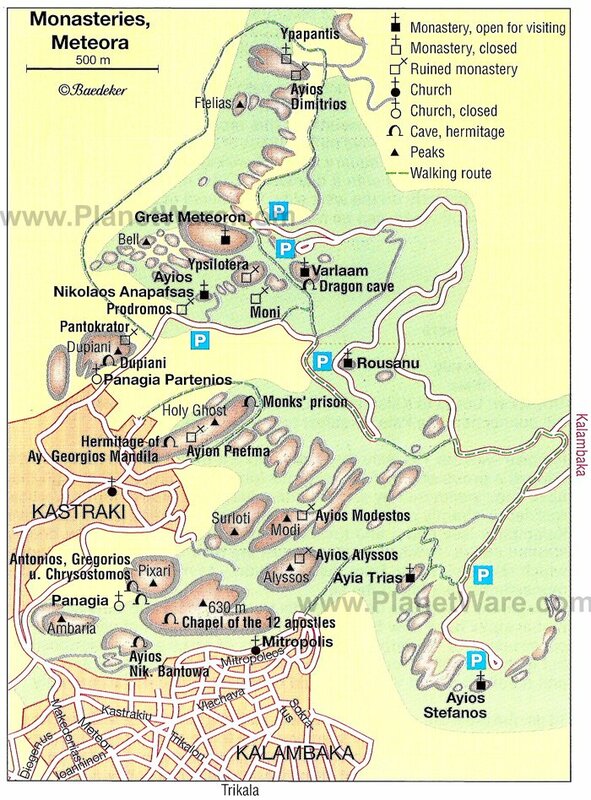 There is a day trip option from Athens to Meteroa as well. However, if you’re going to spend 5 hours on a train, you should really spend at least a night here. 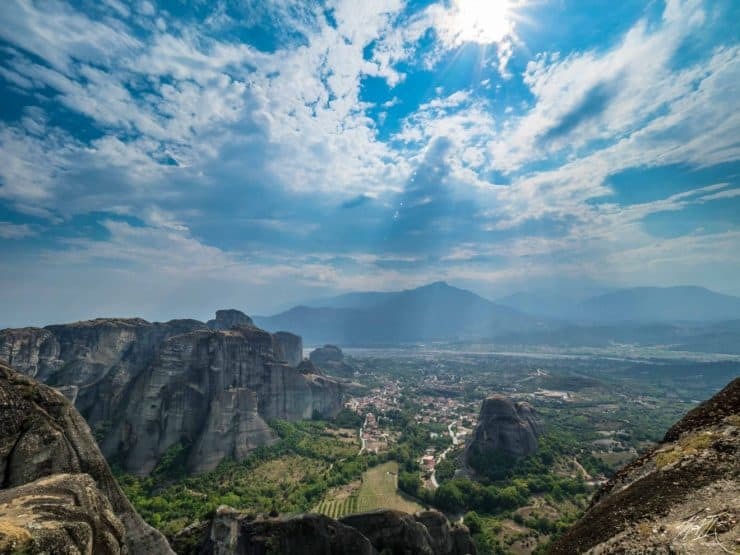 On a side note, I’m an avid rock climber, and rock climbing in Meteora is available. 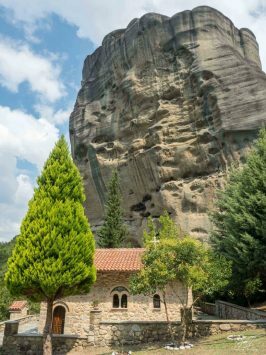 Climbing the massive monoliths with views of the Monasteries perched above the rock is something I really wanted to experience. 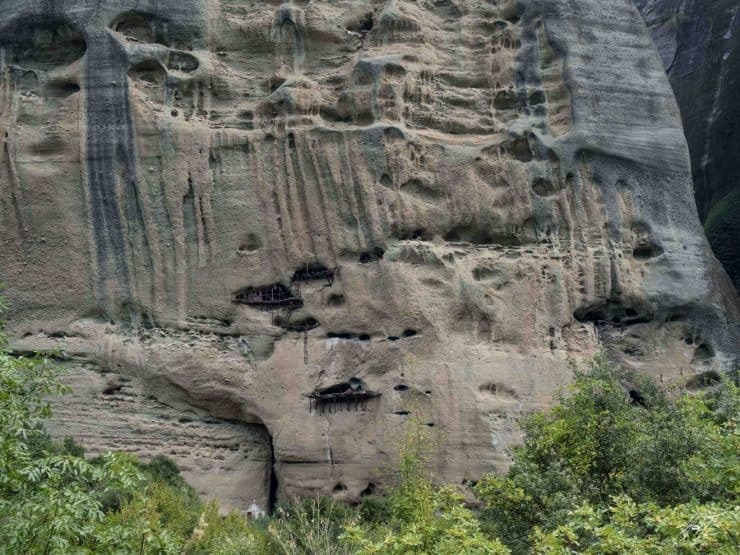 There are both sports and trad routes. 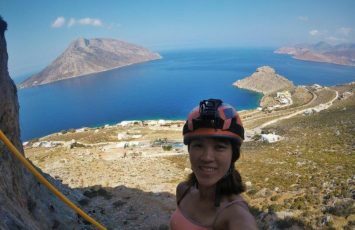 Sadly, I visited during the hottest time of the year and when I went to check out the climbing areas I wasn’t able to find any climbers. 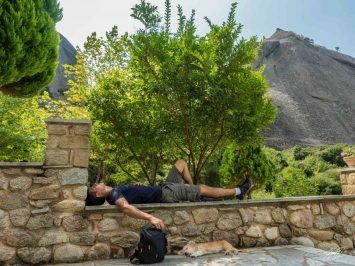 The lady at my guesthouse said that all the climbers only visit during the cooler part of the year. However, if you are willing to spend money on a guide you can check out this link.